No other phone gives you the feel what the One Plus One offers. It looks like a premium device with features like that of a flagship smartphone. It is a complete smartphone with high end features that suits your budget. One Plus One has been a sensation for a long time due to its low cost price and high-end features. This latest Chinese handset has earned the reputation of being a ‘flagship killer’ and is now a global brand identity. If you have a desire to own a new handset soon then we have great news for you. Everyone wants to have a perfect smartphone that is next to impossible. So, One Plus One fulfills your desire with its tagline “Never Settle” and settles to most of your desires. As of now, One Plus One is available in less stock through single retailer. One of the headline features that is making waves is that the device runs on CyanogenMod OS. There is a lot to know about One Plus One and I am eager to share it with you. OnePlus One Smartphone has an arched back and has a polycarbonate build along with an elegant chassis and great specs makes this device to have a premium look. One Plus One is actually a flagship device at low cost than to its competitors. One Plus One has a 5.5” display and is 1.7mm taller and 0.6mm thicker when compared to [p2p type=”slug” value=”samsung-galaxy-note-3-consider-nextgen-smartphone”]Galaxy Note 3[/p2p]. It is 4mm narrower and 6 grams lighter than Samsung’s flagship device. On a whole holding One Plus One is a pleasant experience as some are not comfortable with this size. When had a look at its specifications, it seems that the device has a lot to offer, mostly the appeal lies in its hardware, no doubt for this. One Plus One has a 5.5” 1080p IPS LCD and has a pixel density of 401 ppi. Since it has an IPS panel, the handset’s viewing angles are best in the smartphone industry. The device also features a slab of Gorilla Glass 3 making it scratch resistance. There is a 5MP front-facing camera on top next to the ear pieces. Its back cover can be changed that has the ability to customize its hardware. 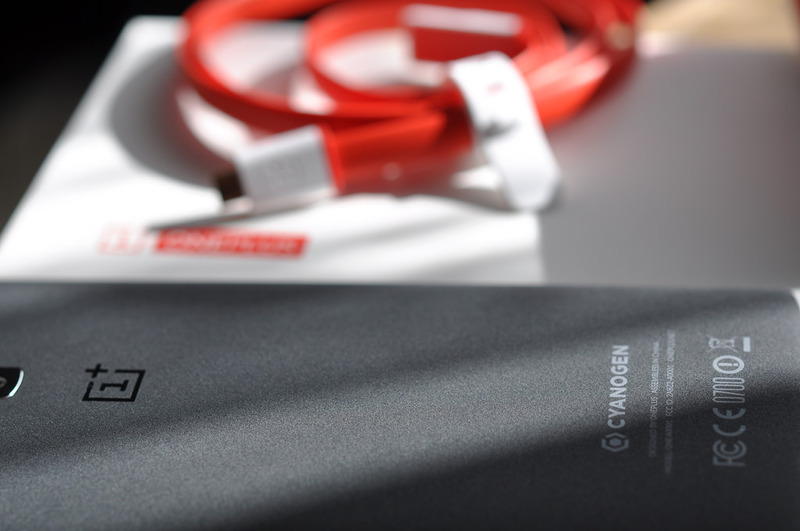 One Plus One partners with CyanogenMod making it to be the first smartphone that comes with firmware. The One comes with set of capacitive keys below the screen and you can deactivate them and go for a soft buttons. One Plus One enables you to use gestures for activating different parts of the phone. Like, a double tap wakes the device, V motion activates the LED flashlight and using 2 fingers you can turn on the music. The phone has a 2.45GHz quad-core Snapdragon 801 processor, a 578MHz Adreno 330 GPU and a 3GB RAM. CyanogenMod gives you the option to change your performance profile from one of three modes. You can also adjust some of the settings from minimum to maximum CPU frequency. One has a battery life of 3100mAh with non-removable cell. Its battery life is more than that of Galaxy S5 and HTC One M8. One Plus One definitely excels to live up its reputation of being a flagship killer. It can give a serious competition to the existing players in the market like Samsung Galaxy Note 4, HTC One M8, [p2p type=”slug” value=”can-get-great-mobile-still-save-money-sony-xperia-z1-vs-lg-nexus-5″]Sony Xperia Z and Moto G2[/p2p]. One Plus One is not quite inexpensive as it has elegant looks and performs well. It is hard to believe that it is a first generation smartphone. It surely outperforms Nexus 5 in almost every way. This handset is good in terms of specs and power and money can also be saved by forgetting about Sony, HTC and Sony. For just Rs. 21999 you can grab 16GB model and overlook certain negatives, if any. This brand gives a lot in the name of camera and the biggest of all, availability. It is perfect for all and fulfills all your needs. Though imperfections has always a new discovery in the making. Which is the right iPhone model for me? Just got my Oneplus One, the Sim card hole is perfectly fine and i could easily remove the sim tray with the provided pin and also packed in was additional sim tray. Just love the Phone and loved the packaging. Its a very nice effort. I have visited this website first time and become fan of it. Keep it up.